(CNN) -- Australia's Cadel Evans finally landed one of cycling's big prizes as he claimed the world road race championship title in Switzerland on Sunday. 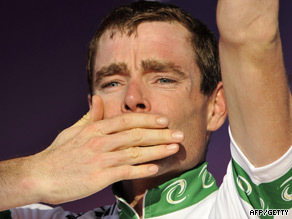 An emotional Evans savours his superb victory in the world road race championship. Evans escaped a whittled down leading group on the final climb of the marathon 262.2 kilometer test to cross the line 27 seconds clear of the chasers. Alexandr Kolobnev of Russia outsprinted Spain's Joaquin Rodriguez in a sprint finish for second place. But there was no fairytale finish for Swiss hero Fabian Cancellara, who was in the hunt on the last of 19 laps, but wound up fifth behind Olympic road race champion Samuel Sanchez of Spain. Cancellara was aiming for a historic double after winning the men's individual time trial on Thursday, but could not break away from the leading group on a technical downhill section before the last climb, despite a massive effort. Evans clung on to his wheel and was well-placed to make his move as he broke clear with Kolobnev and Rodriguez as the course went up again. The race favorites, including Tour of Spain winner Alejandro Valverde and Cancellara, were unwilling to sacrifice themselves to give chase and Evans used his extra strength to go clear of his breakaway companions. He is the first Australia to win the rainbow jersey for the world road crown and lays to rest a reputation for missing out on victories in major races because of a lack of attacking intent. Evans, who rides for Silence Lotto, finished third behind Valverde in the Tour of Spain to confirm his fine form and timed his move perfectly after nearly seven hours in the saddle. The 32-year-old has twice finished runner-up in the Tour de France, but put on a disappointing display in this year's race as one of the favorites. The women's road race title on Saturday went to Italian Tatiana Guderzo from Marianne Vos of the Netherlands and her teammate Noemi Cantele in bronze. Like Evans, Guderzo waited until the final climb to make her move and had a 19-second advantage by the finish to claim gold.